Arshake is an atelier born to contextualize technology and art in the wider cultural context and throughout time by producing information and new projects, first of all hosted on a dedicated banner on the website. Technology is here deconstructed, reinterpreted and reinvented in humanistic terms, reconnecting to all kind of disciplines. ArShake bridges many things: institutions and underground, past and present, information and production, analogic and digital, tradition and innovation, research and trend. Art, as an empathic instrument, plants its roots in technology in a backwards journey that investigates its origins and meaning in the world. 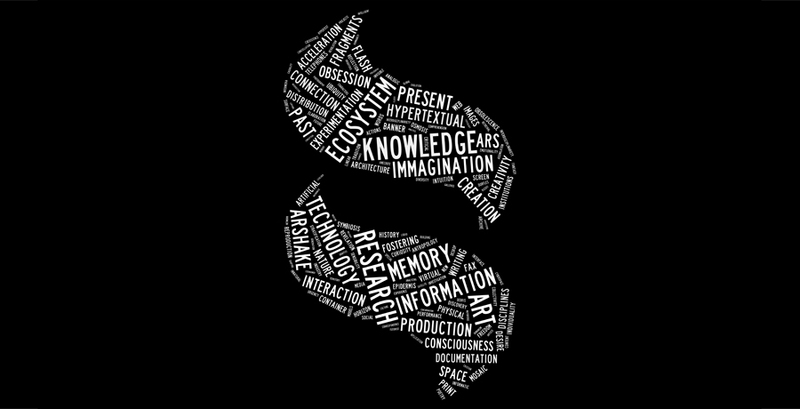 The gradual acquisition of awareness allows for the possibility of controlling and ‘reinventing’ it in modern terms. The preferred instrument here is the recounting and experiencing of art in its encounter with disciplines as disparate as architecture, design, fashion and sound, as well as mathematics, physics and philosophy. The obsession with hypertextual links, with the mixing of languages, and with the intersection of aesthetic tastes and social interests are the humus that Arshake offers for the birth of this new ecosystem being developed both on- and offline. The factors of development and the point of reference for the evolution of this ecosystem are the motto of Bruno Munari: “Da cosa nasce cosa / One thing leads to another.” The production of knowledge generates creativity which, in turn, generates new knowledge, and so on. From this corner of the ‘planetary garden’ a new adventure begins. Its roots are in Italy and it spreads throughout the world, virtually and physically, carrying forth the best of Italian creativity and hosting and interacting with international talents. ArShake starts as a website (Italian/English). In conjunction with the major social networks, it functions as a context provider, opening to a variety of interdisciplinary collaborations and directed to a vast public, from curious to professionals. Focus is the space where Arshakes reflects on technology in the wider context of culture, through observation of events, conversation with artists, interviews with specialists from different disciplines, analysis of projects and much more. On a quarterly basis, ArShake’s banner hosts a special project by either Italian or international artists, selected upon invitation or through a call for competition. The special project, according to the spirit of ArShake, aims to stimulate a cross-language experimentation. Keeping this in mind, street artists, painters, fashion designers, and creatives from a variety of backgrounds and branches of art are invited to express themselves on the site, sometimes using it as a mean to extend their research paths. The work can either be the banner itself, or it can work as an advertisement of a project happening in the physical space, or in the virtual world as a site of its own. The special project, together with ArShake’s contents, strives to build an ecosystem where information, image, design, and creativity interact to produce ever evolving situations. Frame is one of Arshake’s visual components, together with video post and with the special project. The images that are captured from the Internet as well realized for the website, offer visual hints. They can function by itself as well as an instruments for an hypertextual exercise, in illustrating some leit-motiv of the website’s contents and in anticipating future deepenings. This material is intended to evolve in future formulas of meta-narration. Dedicated to a playful but attentive selection of videos, video post is one of the Arshake’s visual component. Here you can browse short videos that talk about new themes as well as support arguments that already discussed on the website. A list of links that comprises specialized institutions, institutions of contemporary art that dedicated a particular interest towards these themes, galleries, festivals, underground platforms, and journals are made available with a brief introduction to the mission of each. The words of this lettering work, realized by young Italian artist Cristian Rizzuti, author of the website’ graphic lay-out as well as the logo, derive from the ArShake’s Manifesto. The words are elaborated by a software, their size depends on the frequency with which these words are repeated through the Manifesto’s text. Manifesto in tags means to offer a visual synthesis of the number of facets of Art Shake’s mission.